Hey y’all! Here’s a guest post that’s a little backdated from last year done by another friend and writer for The Occasional Traveller – Misty headed up to Kuala Lumpur over a long weekend last year, and I got her in touch with the Pacific Regency Hotel people and she got to check out the Pacific Express Hotel Central Market in Kuala Lumpur (affiliate link) for me – here is her review on her stay. The folks at the Pacific Regency Hotel group kindly invited me and my partner to spend a night in the Pacific Express Hotel Central Market in downtown KL – Overall I enjoyed the short getaway in a city that’s really familiar to most of us, you don’t have to be stressed out by having to plan too much. I feel that the hotel is perfect for visitors who want to maximise their holiday by being right in the center of things in an affordable no-frills, yet comfortable hotel. Here’s more on my stay. 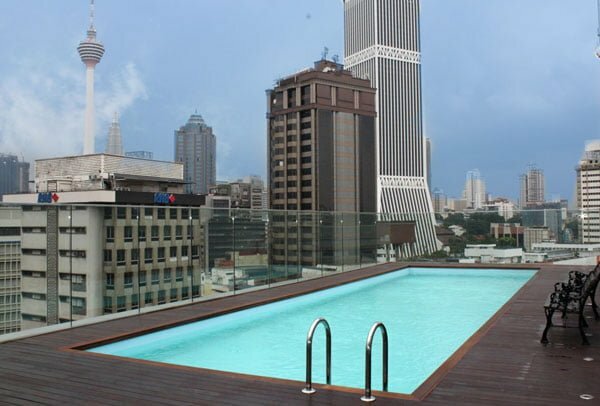 The hotel is located right in the thick of the action – as its name implies, it is right next to the famous Central Market in KL. 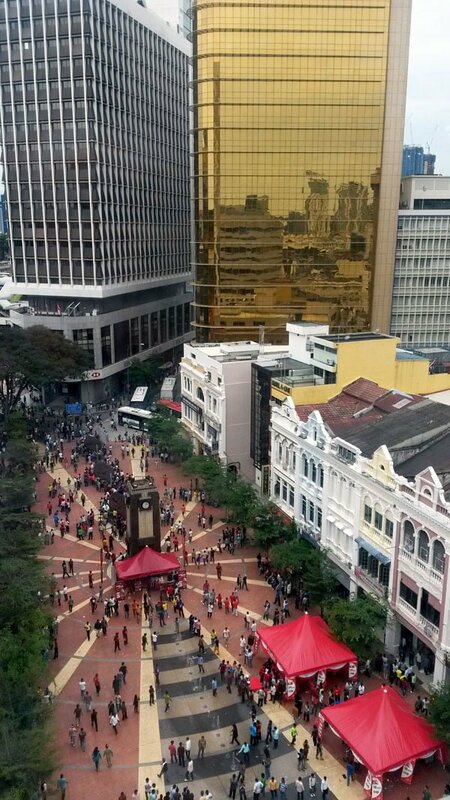 Other popular landmarks within walking distance are Merdeka Square and Chinatown on Petaling Street. We chose the Chinatown drop-off point in KL as it would be easier to get to the hotel, and in 5 1/2 hours we found ourselves in the heart of Chinatown KL. At 5am, nothing much was open, so we camped at a 24-hour McDonald’s first to wait for the subway trains to start running. Once the city was up, finding the hotel was relatively easy with a map in hand. It is within 10 minutes walk of two LRT stations – Pasar Seni (near Chinatown) and Masjid Janek (right next to the mosque it is named after). The central location also means that getting around by public transport is very convenient. You can walk to nearby attractions such as Chinatown and Central Market, or you can take the subway to the KLCC or Bukit Bintang shopping belts. There is also a free public bus service within the CBD area of KL, called Go KL although we did not try it, as the roads can get quite congested during weekend peak hours so the subway might be a better option. The room offerings are pretty standard for your average hotel room – The furnishings still looked shiny and new – the hotel is less than a year old after all. And don’t worry, it comes with the very important feature – free wifi! Breakfast was provided for our stay [is it a standard part of the hotel package? or extra?] which you have at Uncle Lim’s, the small café on the ground floor of the hotel. You get to pick from you to a set breakfast choice of American (eggs, sausage, hash brown, the works) or Asian (Nasi Lemak which is coconut rice with curry chicken; or Chinese style noodles in soup). I tried the nasi lemak, it was a pretty generous portion! The food was not too bad if you’re too lazy to head out or need something convenient and quick. As for F&B options, besides Uncle Lim’s there is also a small 24-hour convenience store called myNEWS.com where you can grab snacks and other light bites. The hotel provides complimentary shuttle service to popular shopping malls at KLCC and Bukit Bintang at 10am and 3pm daily, you need to inform the concierge at least 30 minutes in advance to take the shuttle. We took the 10am one to Bukit Bintang which dropped us off at the Pavilion KL mall. Do note though that there is no return trip. Pacific Express Hotel is a literal stone’s throw away from Central Market, so that’s something you definitely can’t miss. Stepping into this large two-storey building is like entering an Aladdin’s cave of arts and handicraft goods: neatly laid out in themed lanes are stores selling traditional fabrics and ethnic crafts, tourist souvenirs and knick-knacks, antiques, artwork, handbags and clothes, among others. We even spotted a full suit of armour at one of the corner stores on the second floor! Another bonus: the whole market is air-conditioned, a welcome respite from the humidity (or rain) and there is a food court on the second storey. 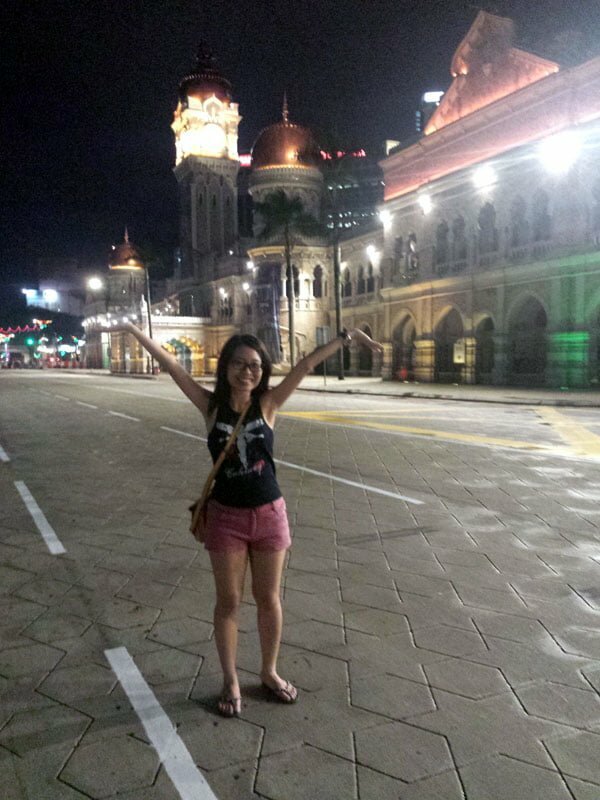 Enjoying the empty streets: On my right is the Sultan Abdul Samad Building, a historical landmark where Malaysia declared her independence on 31 August 1957. The building is now home to government offices. To my left (and not in the picture) is Merdeka Square. Merdeka Square is a short walk away on the other side of the hotel, and we discovered that fthe roads in front of Merdeka Square are closed to traffic from Saturday nights to Sundays. This is so that visitors can roam around the attractions freely, and there are even parades and activities held on the roads sometimes. There are also many cultural attractions located nearby and worth checking out if you have the time, such as the National Textile Museum, and Kuala Lumpur City Gallery. A Deluxe Room normally goes for RM 147 and above, which is pretty decent for a mid-range, centrally located hotel with new amenities. 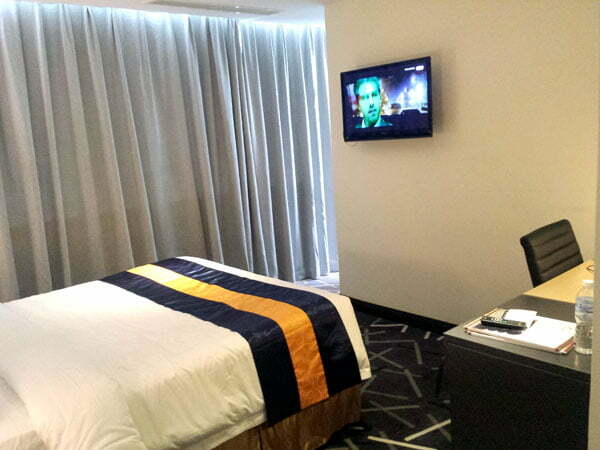 Though if you don’t mind taking the smaller Standard rooms without windows, prices drop to around RM 100, and they even dropped prices as low as RM 59 for twin sharing during the last holiday season! Check out the offers page on their website for the latest deals. 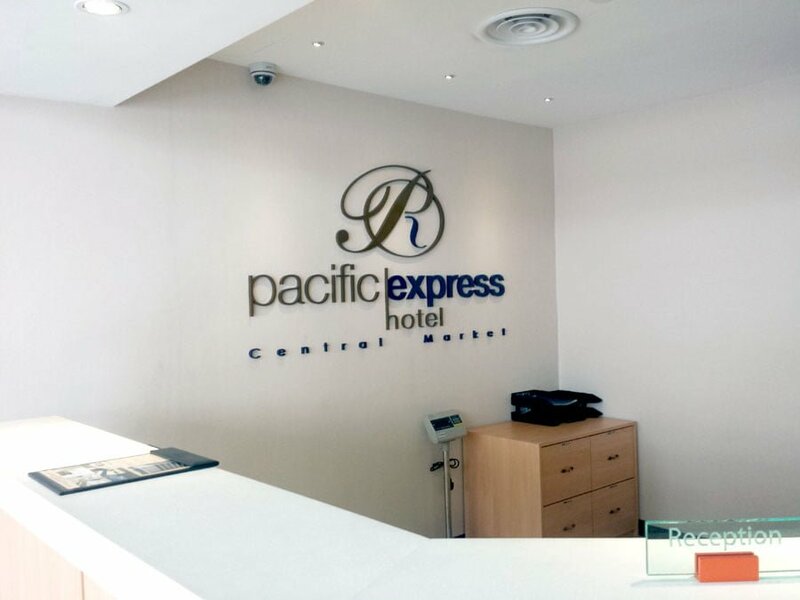 Make a booking at Pacific Express Hotel Central Market via booking.com – clicking via this link doesn’t cost you any extra but may give me a small commission that helps keep this site running.